Texter is Lifehacker creation so it was pretty much impossible to miss it on tech landscape. Just the thing I ignore until long after hype peak passes. :) Karl had recently posted about Texter at MakUseOf and I deemed it time to check out this text replacement tool. Texter allows to set up chunk of text that will be replaced with another chunk of text when typed. It has a lot of possible uses, but obviously the more often you type repetitive text the more value you will find in concept. Change can be triggered immediately or after one/either of specific keys. It gives nice differentiation between snippets that go in the middle of typing and some that might require definitive action to make replacement. will take a link from clipboard, type it out as XHTML tag and place cursor right where you need to finish with anchor text. For even more complex tricks Texter can also flexibly simulate most all of keyboard. To keep replacement setups separated by topic there is option to create and import/export bundles. App is coded in AutoHotkey and being from neighboring AutoIt camp I won’t hold it against Texter. Still it is clearly one of less solid utilities. Things jump around in interface, native autorun is not working and at occasions Texter just didn’t trigger replacement for no apparent reason. There is optional spell check function, which is separate nightmare. I disabled it soon when I found out that I could no longer type answer without it being changed to andwer. Later I got even larger gripe with it – Texter apparently keeps replacements in text files, and for spell check it creates 4400+ of those in one of the folders. It is nightmare for sync and if deleted those files are promptly re-created. I like what app does and how it does it but not how poorly it is coded. And being abandoned by developer there is little hope that kinks and bugs will be ever fixed, even open source didn’t help with that in two years since last update. So, any suggestions? I hardly remember many similar utilities around. I really liked the idea and tried to use this utility for a while, but bugs made it pretty much unusable for me, so I had to uninstall. Too bad, though; if not for the bugs, it would be quite handy. Yeah, idea is sure solid. Decent text editors like Notepad++ usually have text replacement stuff… But it is confined to app itself. Definitely need to poke around for something better. I tried a number of similar utilities, but eventually uninstall all of them. 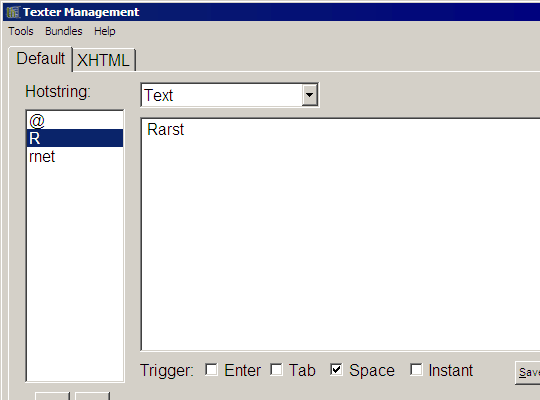 Currently using ArsClip’s (http://www.joejoesoft.com/cms/showpage.php?cid=97) permanent items feature for text replacement. I use my launcher, Keybreeze, for this. I use it to insert lines that I would otherwise have to hold down the dash key or = key or whatever I am in the mood for. Personally, I like this one: – – – – – – – – – – – – – – – – – – – – – – – – – – to run across the page. Then there are the tedious things, like address, email, phone#. But best of all, I don’t have to open a symbol map to type in words and names that I commonly use, such as, Lóegaire or Cenn-fáelad. Hmph. Kinda made mincemeat of my nifty line there, Rarst. Truncation at the expense of esthetics? I have that one bookmarked after clipboard posts and many comments. Will get to it eventually. I vaguely remember trying that launcher long time ago, didn’t like it. Need to re-visit some time. Free version seems way too limited. I think I had used another product of theirs Macro Express in the past, but moved on to AutoIt since. dime ! Have been using Short Keys for YEARS now.